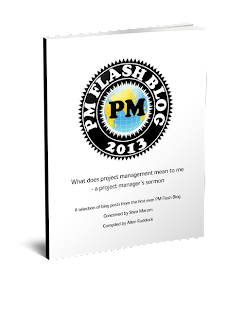 Musings on project management: Everyone estimates! We all make estimates; and we all make estimates all the time. When I make the 20 mile trip each Tuesday to a client site, I estimate adjustments to a baseline based on weather and road construction and if I know about an accident. Really, no one sets out to do anything meaningful without some estimate in mind re time, or cost, or risk; usually we can also notionally estimate the scope. Rule 1: Estimating is not a vote. Well, actually, there's a lot of voting in estimating as a group agrees on a consensus, so I don't agree with Mike on this one, but he's welcome to his idea. Rule 3: Everyone participates; even if you don't know what you're talking about. Seems curious, but Mike's idea is that most estimating is relative (see above), so even the uninformed can make some contribution to the discussion. My take: perhaps, but the uninformed often don't have "permission" to be in the decision making. Anyway, to end with the beginning in mind: We all make estimates; and we all make estimates all the time.